A University of Kansas anthropological geneticist is part of an international research team working to shed light upon one of the unanswered questions concerning the peopling of the New World: Namely, what was the size of the original founding population of the Americas? Despite numerous genetic studies that have helped contribute to knowledge about how ancient groups populated the Americas, scientists have not reached a consensus about how many Native Americans made up the original population. This analysis of DNA sequences suggests the Native American founding population that migrated from Siberia consisted of approximately 250 people. The study "How strong was the bottleneck associated to the peopling of the Americas? New insights from multilocus sequence data," published in the journal Genetics and Molecular Biology, includes Michael Crawford, KU professor of anthropology, and the researchers' results corroborate findings of previous studies that were based on smaller datasets. "Going from a few hundred founders to around 40 million inhabitants of the Americas, who eventually live under different environmental conditions to which they adapt, is pretty exciting stuff," said Crawford, also head of KU's Laboratory of Biological Anthropology. "It's about understanding how evolution operates in terms of genetic diversity." The researchers examined nine noncoding regions of the DNA samples collected from populations that trace the path of the migration. This included samples of individuals from China, 10 Siberian groups and from 10 Native American populations scattered across Central and South America representing several different tribal affiliations. The Siberian population samples were collected just following the collapse of the Soviet Union. 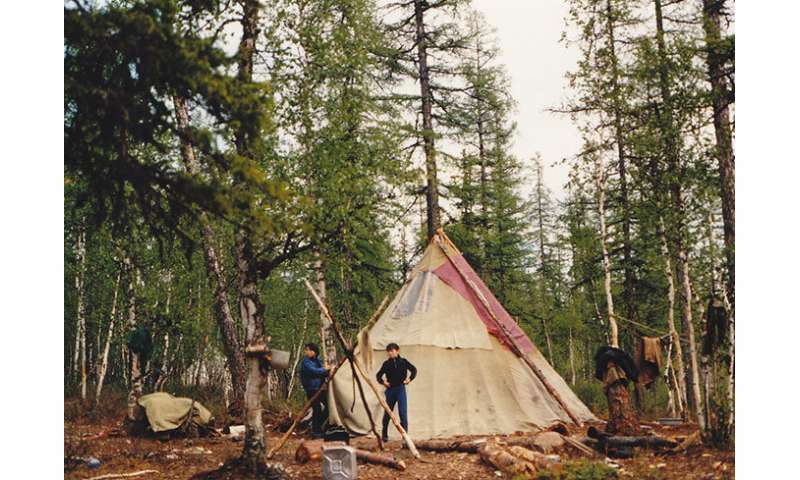 Crawford is an expert on genetic markers of Siberian human populations. Funded by the National Science Foundation, he led the first foreign anthropological team into Siberia in 1989 after the breakup of the Soviet Union. 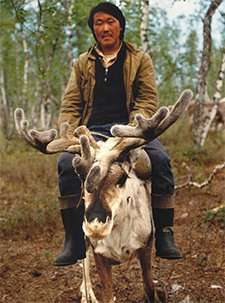 He also has worked on Aleut and Eskimo migration patterns from Siberia. "It is difficult to go back in time to follow the populations, but we can characterize contemporary genetic diversity and estimate the mutation rates that have occurred in different regions," Crawford said. In a 2015 study, Crawford was part of a group that found the ancestors of all present-day Native Americans entered the Americas from Siberia into what is now Alaska no earlier than 23,000 years ago. This founding group did split into the Athabascans and Amerindians after spending no more than an 8,000-year isolation period in Beringia—the land bridge that once connected Siberia to Alaska. In this new study, the researchers sequenced DNA from the nine independent, noncoding regions of the genomes from indigenous peoples distributed from China to South America spanning over 15,000 years. They determined the breeding size or founding populations by isolation-with-migration computer simulation models based on 100 million generations. Each analysis revealed founding groups were between about 229 to 300 people. This led the group to estimate the parameter for the original founding population of Native Americans of about 250 people. Recognizing the size of this genetic bottleneck during the populating of the Americas is important for determining the extent of genetic markers needed to characterize Native American populations in genome-wide studies and to evaluate the adaptive potential of genetic variants in this population, according to the research group. Crawford said the genetic data helps paint a fascinating picture of how the ancient migration unfolded. "It wasn't a matter of a group that announced, 'Let's go follow this one,'" he said. "It was a matter of population fission among hunters and gatherers. There would be about 50 people, and when the population's fertility gets higher and higher, the population splits into the next so-called 'county' and then the next. After 15,000 years, you can put them all the way down in Argentina." "Native Americans entered the Americas from Siberia into what is now Alaska no earlier than 23,000 years ago. . . After 15,000 years, you can put them all the way down in Argentina." Well, considering that they were already in Chile 30,000 years ago, and possibly even earlier in Brasil, I think their dating leaves a bit to be desired. Which then makes me wonder about the quality of the rest of their work. Citations? On what do you base this information? 30 000 is still not fully accepted, but 18 500 BP seems to be robust. The 18500 timeline seems more likely, although I have seen some studies suggesting the older dates. I like that the lines of evidence seem to be converging, but I think there is a lot of study left. One wonders if there were other ways to get to the Americas - I think of the Polynesians and their ocean-crossing abilities. Interesting stuff! It seems that the panspermia hypothesis is back in the game: new peer-reviewed study in Science journal explain Cambrian Explosion with it: "In our view the totality of the multifactorial data and critical analyses assembled by Fred Hoyle, Chandra Wickramasinghe and their many colleagues since the 1960s leads to a very plausible conclusion – life may have been seeded here on Earth by life-bearing comets as soon as conditions on Earth allowed it to flourish (about or just before 4.1 Billion years ago); and living organisms such as space-resistant and space-hardy bacteria, viruses, more complex eukaryotic cells, fertilised ova and seeds have been continuously delivered ever since to Earth so being one important driver of further terrestrial evolution which has resulted in considerable genetic diversity and which has led to the emergence of mankind." That's interesting, but not sure what is has to do with humans arriving in the Americas about 4 billion years later. I do love how they put "entered the Americas from Siberia" right next to "NATIVE Americans" ... talk about missing the point. This is supposed to be science, so how about we tell the truth? Article is open source and if you would find the time for its reading (which is particularly recommended just for traditional PhysOrg parrots like CaptainStumpy, Da Schneib, JonesDave or Antialias who use to downvote such an ideas the most), they could take a way wider memo from it, because it's not just about evolution - but also about systematic deform of methods of contemporary science. It's undoubtedly the most "creationist" article which emerged in top impacted journal during last fifty or maybe seventy years. As you can see, under Trump leadership even the scientists started to think more freely. Anybody got any idea what this loon is on about? These are well-documented sites, there are others for which dating and identification are not so clear-cut but which are intriguing. In particular is a cave in Mato Grosso which appears to have a hearth with a very early date (38,000 BP if I remember correctly), but no human artifacts were discovered associated with it so it was never definitively identified as not-natural. Interesting, this puts a narrow estimate on the minimum population size. But if the migration was average, the actual size is a couple of times the breeding size (lack of descendants, inbreeding). @WE: "Native Americans" is a social label and reflects the researched facts (or truth, as you label that) as is. I can agree that the term is dated, especially when describing genetic flow of moving populations! Okey, but I can from top of my head (i.e. risking errors) note that the oldest Cerutti and Topper are not well-documented on humans respectively dating. In fact, I believe the Topper dating is now known to be wrong and much younger. Bluefish Caves is correct, but belong to the part "entered the Americas from Siberia into what is now Alaska no earlier than 23,000 years ago" of the Beringian stand still in the article [ https://en.wikipe...sh_Caves ]. Santa Elina rock shelter (Matto Grosso) on the other hand is really interesting, after locating the article I recognized it [ http://ancientnew...n-paris/ ; https://www.cambr...BDFB928E ]. "Now, the oldest full genome to be sequenced from the Americas suggests that some settlers stayed in Beringia while another group headed south and formed the population from which all living Native Americans descend." [ctd] That's a compelling speculation, Mulligan says. "Once they got into North America, they really high-tailed it through the continent and down into South America within just a few thousand years," she says. A cultural or genetic penchant for exploration "could help explain why they were in such a hurry."" Reconciling the shelter dates - if they bear up, c.f. how the Flores cave dating was changed when they understood the local geology better, here the ash is unidentified and the ostracoderms may be old fossil when worked - with the genetic evidence will be an interesting task. I have not looked in the new paper if that is looked at. Oh, glad you asked! In general terms, yes. It is correct as the apparently creationist,Trump thumping commenter notes that the paper, as well as many of its authors such as C Wickramasinghe those theories the paper generally lauds, is creationist. CW criticized evolution in the Arkansas creationist case. And the paper unwittingly borrows a graph showing many hundreds of billions of years on the left axis, as well as claiming standard phylogenies are wrong. The paper should not have been published, even as a review, in Progress of Biophysics and Molecular Biology since it contains nothing acceptablein those areas. The review is stated as cherry picking instead of being an area review: "We review the salient evidence consistent with or predicted by the Hoyle-Wickramasinghe (H-W) thesis of Cometary (Cosmic) Biology." - The quantum physics of synaptic communication via the SNARE protein complex"! The lead author is proposing Lamarckism since before and writes out of a charity [ https://www.cyovi...d-centre ], the second author is in fact at one of CW's own university affiliations [ https://www.bucki...rch/bcab ], et cetera. Capitalizing species and other names for no good reason, an "admittedly unusual, scientific writing style" (i.e. little to none). All appear crackpots by association. [b]" somewhat like a last-ditch and exasperated attempt to convince the main stream of the scientific community that in following neo-Darwinism they have gone seriously astray, because life has been carried to this planet from elsewhere in the universe on comets/meteorites and does not result from abiogenesis on Earth. "[/b] "
So the authors revised, and the editors unwisely accepted. ... "The recent report indicating evidence of microbial life in Canadian rocks that formed 4.1–4.23 billion years ago (Dodd et al., 2017), if accepted, makes it more difficult in our view to envisage the option of abiogenesis taking place anywhere on the Earth. The claim that these rocks may have been associated with hydrothermal vents still raises the question of how life could have originated in situ during the early Hadean epoch that was riddled with frequent and violent collisions by asteroids and comets. Rather we think it more reasonable to suggest that the particular evidence of microbial life in the Canadian rocks was delivered by cometary bolides, only to be instantly destroyed or carbonised on impact." Still looks "somewhat like a last-ditch and exasperated attempt to convince" from a basis of no contrary - to current science - data. Worse, the incoming data rejects possible creationist ideas based on speculations in non-indigenous emergence of life. Ouch, I failed the bolding, too many comments to do. Oh well, I can as well add that the Late Heavy Bombardment the review seems to refer to is in tension with statistical procedures (the impact spike may be an artifact) as well as other impact data (shows no spike or even increase compared to today's impact flow). So an open question - but not suggesting life delivery as more reasonable than in situ emergence.